We could tell you all about our understanding of empathy, about how much it changes how you interact with others, how you listen, learn, and teach. But that wouldn’t really be YOUR understanding of empathy! We’ve devised a simple program to gain empathy by literally changing how people look at you, and in turn, how you look at yourself from the outside in and inside out. Kevin started this program after thinking about how hard it is to explain what it feels like to be a disabled person in a world designed for able bodies. Here’s how it works. get a hold of one of our Crippled Wisdom tattoos (like the one pictured on this page). Apply the tattoo to your face, preferably somewhere conspicuous like your forehead, cheek, or neck. Be brave with where you place the tattoo, you’ll get more out of it. Then, wear the tattoo for at least 24 hours and go everywhere you typically do, talk to people the way you typically do, socialize the way you typically do. 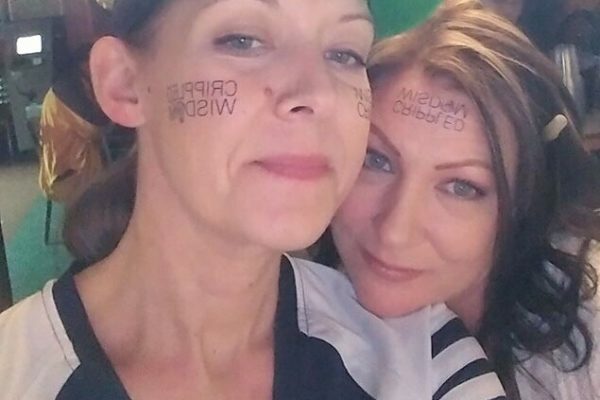 You’ll be looked at, stared at, asked why you have a Crippled Wisdom tattoo on your face. You might even be teased. These are things that happen to anyone with a disability every day. But, the nonverbal reaction is only a small part of it. It’s the conversations you have because of that tattoo that matter most – conversations with yourself and conversations with others. Can you do it? Do you feel different with the tattoo? Do others look at you differently than they usually do? Do you socialize differently? Do you feel you are being judged unfairly? Wearing the Crippled Wisdom Empathy Tattoo starts from the perspective of disability, but it’s really about perspective. Period. And not just your perspective. Seeing how others see the world from the outside in is the most powerful of perspectives. It allows us to dig deep, learn, grow, and truly make every day better than the last. We look forward to hearing about your experience on our Crippled Wisdom Facebook page or Instagram or Twitter. Step 1. Peel off glossy adhesive film that is covering the Crippled Wisdom Empathy Tattoo. Step 2. 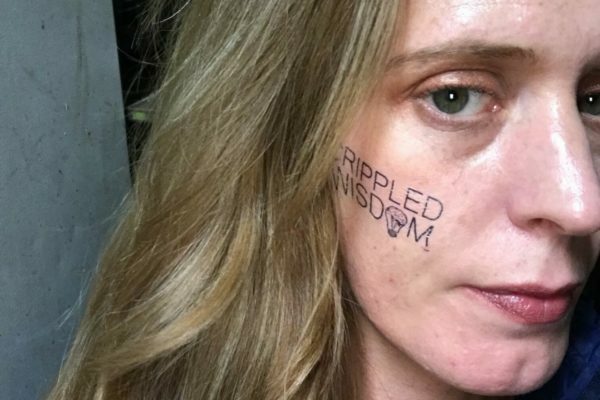 Place the Crippled Wisdom Empathy Tattoo onto your skin. Making sure to apply ample amount of pressure to ensure placement of the image. Step 3. Wet a towel and dab the tattoo well for about 10 seconds. Make sure that that entire surface of the paper is covered with water in order for the tattoo to transfer properly. Step 4. Once the paper has been properly moistened, remove the backing paper slowly. Step 5. That it! Reveal your Crippled Wisdom Empathy Tattoo and get ready for a life changing experience! Crippled Wisdom Empath Card Program Coming Soon! The Crippled Wisdom Empathy Card is designed to bring awareness of how individual actions impact a group, community and a society. When acts of kindness or rudeness are observed an empathy card is to be given indirectly and after the act has past. By doing this it only give acknowledgement that the individual committed an act of kindness or rudeness was observed. Rewarding or shaming actions do not improve basic behavior. The individual receiving the card then automatically begins to reflect on all their actions prior to receiving the card. This pondering of actions builds self-awareness and understanding that actions are noticed. The second component to the program is monitoring and reporting which strengthen community awareness.